I Love My Church, Christian TShirt. Go Ahead and Click that Add to Cart button and get yourself a Christian Shirt today! For other Apparel and Styles please click on our Brand Name. Copyright, All rights reserved. Great gift idea for a recent Baptism. 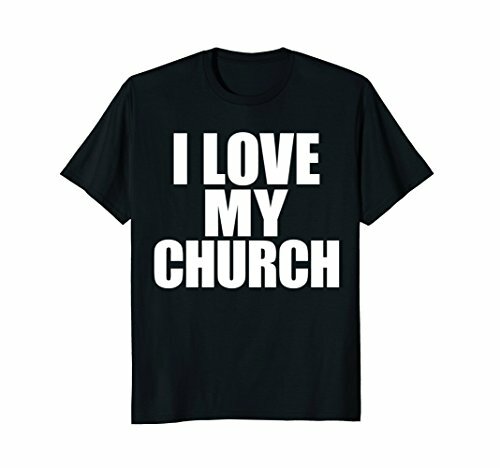 If you love your Church this is the Tee Shirt for you. Great gift idea for your Pastor, Youth Pastor, Church Members, Youth Group, Christmas or a Birthday. Shout it from the roof and tell the world the good news of Jesus Christ and what He has done. Tell them the positive and tell them about Church and invite them to experience Christ's love. If you have any questions about this product by Christian Apparel Co., contact us by completing and submitting the form below. If you are looking for a specif part number, please include it with your message.